The journal publishes primarily research articles and review articles by following the peer-review system. Usually two reviewers in the relevant subject fields are invited to review each article. In case there are contradictory comments, additional reviewer(s) may be included for aiding in the final decision. The turn-around time for receiving back the reviewers’ comments will be usually about one month. Manuscripts submitted to this journal must not be under simultaneous consideration by any other publisher and should not have been published elsewhere in substantially similar form. 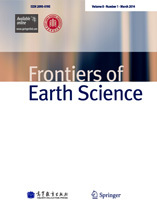 No part of a paper which has been published by Frontiers of Earth Science may be reproduced or published elsewhere without the written permission of the publisher. REVIEW articles giving in-depth overviews of certain topic or reviews on research achievements. EDITORIALS providing important essays of the editors and invited scholars or overviews on certain topic written by guest editor(s) of special issue. Authors are encouraged to submit their original papers electronically via the online submission system (http://mc.manuscriptcentral.com/fesci The web site guides authors stepwise through the creation and uploading of the various files. Note that original source files, rather than PDF files, are required for submission. Once the submission files are uploaded, the system automatically generates an electronic (PDF) proof, which is then used for reviewing. All correspondence, including the editor's decision and request for revisions, will be by e-mail. After reviewing process, the manuscript will be finally judged by one of the editors who have the right to accept or reject a paper. ); the Chief Editor and one of the Associate Editors will jointly handle each article with whom the author can communicate efficiently. A cover letter must be prepared by the authors for each submission indicating the name, address, and telephone number of the corresponding author to whom all correspondence is to be addressed. An affiliation must be supplied for each author. Authors are also asked to provide the names and contact information for four potential referees on their cover letter. However, the journal is not obliged to use the suggested reviewers. Final selection of reviewers will be determined by the editors. Manuscripts should be in a Word format. The following components are required for a complete manuscript: Title, Author(s), Author affiliation(s), Abstract, Keywords, Nomenclature (when needed), Main text, References, Acknowledgements, Appendices, Figure captions, Tables. Include page numbers on the document, beginning with the title page as number 1. It will be preferred if line numbers are included as well. There is no formal limit for the length of a paper, but the editors may recommend condensation when appropriate. Please use standard 10- or 12-point Times New Roman fonts. Title. The title of the paper should be explicit, descriptive and as brief as possible – no more than 20 words in length. Running title. A short version of the paper title (up to 80 characters including space). Author names, (academic degrees) and affiliations. Corresponding author. The name, telephone and fax numbers and the e-mail address of the corresponding author should be given on the first page of the manuscript. In the case of multiple authors, one should be designated as the corresponding author. Abstract. A short abstract of up to 300 words written in one paragraph, clearly indicating the object and scope of the paper as well as the results achieved, should appear on the first page. Keywords. Up to 6 words separated by commas. Headings and subheadings. Headings and subheadings should be used throughout the text to divide the subject matter into its important, logical parts. Typical headings include: Introduction, Materials and methods, Results, Discussion, Conclusions, Acknowledgements, Appendixes and References. Authors should pay attention to the limitations set by the size and layout of the journal. Large tables should be avoided. Reversing columns and rows will often reduce the dimensions of a table. (1) Supply units of measure at the heads of the columns. Abbreviations that are used only in a table should be defined in the footnotes to that table. (2) Should always use rows and columns to correlate two variables. Submitted single-spaced and in the word processing software used. Do not embed tables as graphic files, document objects, or pictures. (3) Submitted as three-line tables, that is, there are three horizontal lines: one under the legend, one under the column heads, and one below the body. Vertical lines are generally not used. (4) Label each table at the top with a Roman numeral followed by the table title. Insert explanatory material and footnotes below the table. Designate footnotes using lowercase superscript letters (a, b, c) reading horizontally across the table. (5) Unless needed, all the words within the tables should be in lowercases. (6) Must be sequentially numbered and called out in the text as, e.g. Table 1. (7) Each table should be typewritten on a separate page of the manuscript. Tables should never be included in the text. Graphs should be practically self-explanatory. Readers should be able to understand them at a glance. Dimensional drawings and diagrams should include only the essential details and as little lettering as possible. They should present more of a picture than a working drawing. (1) Size: should be drawn in the size of they virtually appear. (2) Numbering and title: number all figures (graphs, charts, photographs, and illustrations) in the order of their citation in the text and cited as, e.g. Fig. 1. Include a title for each figure (a brief phrase, preferably no longer than 10 to 15 words). Use (a), (b), (c)… to give titles for subfigures if there are any. (4) Color of figures: unless necessary, better drawn in black and white for line-drawing; and grayscale for images. (5) Figure captions: ensure that each illustration has a caption. A caption should comprise a brief title (not on the figure itself) and a description of the illustration. Keep text in the illustrations themselves to a minimum but explain all symbols and abbreviations used. (6) Figure file formats and location in manuscript: please embed the figures in the text as close as possible to where they are initially cited, as well as upload in TIFF or CorelDraw file formats separately for a quality check. (7) Maps: please use the authorized maps as the basis for map figure drawing. (Like maps published by China Map Press, and the like.) Any maps drawn without an authorized basis have to be submitted with the certificate from the Surveying and Mapping management. All the maps should follow the publishing requirements released by the Government. (8) Unless needed, all the words within the figures should be in lowercases. (1) Formulae should be typewritten whenever possible. (2) It is extremely important that all mathematical symbols and letters used are identified and listed and that the required style of appearance of such symbols is clearly indicated, e.g., bold face, italics, script, outline, etc. (3) Subscripts and superscripts should be set off clearly. (4) Identify in the margin any symbols that might be confused with similar symbols. (5) The words Equation or Equations should appear in full at the beginning of sentences but be abbreviated to Eq. or Eqs. elsewhere. (6) A nomenclature can be included (with the use of = signs) after the abstract if there is a significant number of symbols in the paper. Equations should be located separately from other lines if they are long or complicated. Footnotes should only be used if absolutely essential. In most cases it will be possible to incorporate the information in normal text. Laboratory measurements are expressed using conventional metric units, with relevant Système International (SI) conversion factors expressed secondarily (in parentheses) only at first place mentioned. In tables and figures, a conversion factor to SI should be presented in the footnote or legend. The metric system is preferred for the expression of length, area, mass, and volume. For more details, see the Units of Measure conversion table (absent). The “Acknowledgment section” is the general term for the list of contributions, credits, and other information included at the end of the text of a manuscript but before the references. Conflicts of interest and financial disclosures must be listed in this section. Authors should obtain written permission to include the names of individuals in the Acknowledgment section. Reviews give a general overview of a particular field, providing the reader with an appreciation of the importance of the work, historical context, a summary of recent developments, and a starting point in the specialist literature. Manuscripts should be divided into appropriate sections, with an extensive list of references. In addition to undergoing the same rigorous level of technical peer-review as Research papers, Review articles will be critiqued based on the general impact of the field being reviewed, the relevance of the field to experimental mechanics, preexisting reviews of the field, and acknowledgement of the contributing author as a dominant figure in the field. Therefore, it is strongly recommended that authors interested in submitting a Review article correspond with the Editor prior to submission. General formatting text, illustrations, and references are the same as outlined for research papers. In-text citations must be consistent with the reference list in either numbering or names and year. The references should be presented in a complete fashion, and should be the original publication. References should be cited in the text by the author's surname and year of publication. Grouped citations should be separated by semicolons and given in chronological order: e.g., (Peterson, 1984; Jackson and Whitehead, 1991; Shuman et al., 2001, 2004). Reference section should be arranged alphabetically according to the author's surname. Journal names should be spelled out in full. The first paragraph may contain, the author’s educational background. The degrees should be listed with type of degree in what field, which institution, city, and country, and year degree was earned. The author’s major field of study should be lower-cased. The second paragraph uses the pronoun of the person (he or she) and not the author’s last name. It lists work experience. Job titles are capitalized. The current job must have a location; previous positions may be listed without one. Information concerning previous publications may be included. Current and previous research interests end the paragraph. The third paragraph begins with the author’s title and last name (e.g., Dr. Smith, Prof. Jones, Mr. Kajor, Ms. Hunter). List any memberships in professional societies. Finally, list any awards and work for committees and publications. The E-mail should be supplied as the end of the vitae. If a photograph is provided, the biography will be indented around it. The photograph is placed at the top left of the biography. Personal hobbies will be deleted from the biography. The biography should not exceed 150 words. The corresponding author will be notified by the editors of the acceptance of article and invited to supply an electronic version of the accepted text, if this is not already available. No article can be published unless a signed Copyright Transfer Statement can be received, which ensures a transfer of copyright from the author to the publisher. The file of the Copyright Transfer Statement will be provided with the letter of acceptance of the manuscript. Authors are asked to sign, scan and return it by email or fax to the editorial office of Frontiers of Earth Science. The proof will be sent to the corresponding author and should be returned within 72 hours after receipt. Authors should clarify any questions of the proof in a query file. No new materials are allowed to be inserted at the time of proofreading. Please note that authors are urged to check their proofs carefully before returning one all-inclusive file via e-mail or fax, since subsequent additional corrections will not be possible. For submission inquiries, tracking articles and any information please contact the Frontiers of Earth Science office in Higher Education Press. All correspondence for the journal should be sent to the following address. Please include the manuscript dispatch number in all correspondences. The author will enjoy a fast peer-review track and a smooth production workflow and all accepted articles will be published with the online first publishing on the basis of first-come and first-serve sequence. The accepted manuscripts will get polished in English language by highly qualified editors before typesetting.